With Discovery Channel’s Shark Week underway, we'll be lining up interviews with shark scientists from around the globe over the next few days to give you a behind-the-scenes glimpse at what life is like when every week is shark week! Michelle (Wcisel) Jewell is a predator/prey ecologist, zoologist and three-time karaoke champion. 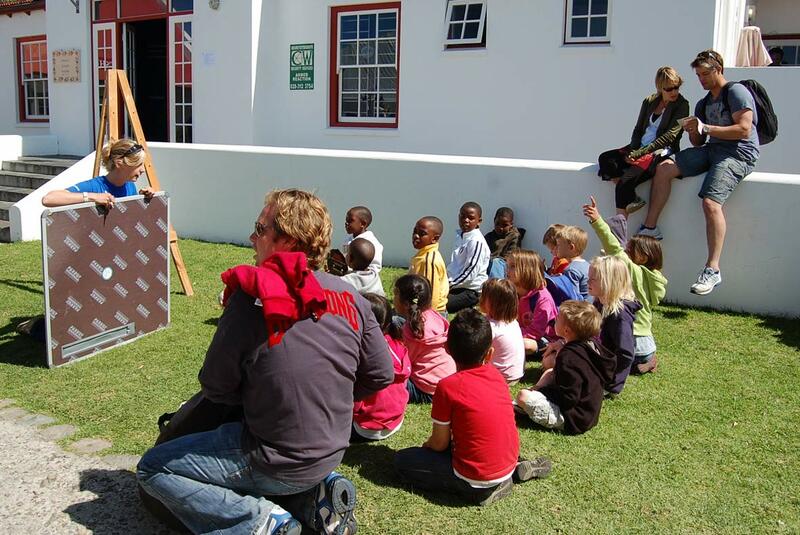 She studied great white sharks and Cape fur seals with the Dyer Island Conservation Trust in Gansbaai, South Africa. Currently, she is a PhD candidate studying climate change impacts on migratory predators across Europe and Africa. Growing up in Michigan, my first exposure to the ocean and sharks was on TV. I was motivated from a very early age to become either a marine biologist, volcanologist or storm-chasing meteorologist. I think my parents were relieved I went with biology ... until I started studying great white sharks. After my Bachelor’s degree, I worked on sea turtles in Florida. I saw my first half-eaten sea turtle there, which would have grossed out most people I suppose, but I was absolutely fascinated! This was a massive female sea turtle sliced in half by the teeth of (presumably) a tiger shark, and in that moment I realised I was to study those things! After living a few months on friends’ couches and in the back of my VW beetle, I had enough money to get to South Africa and work hard. What is it about predator-prey interactions that interests you? This is a very difficult answer to put into words. I think the specialisation of every scientist is something they are inexplicably attracted to. I've always loved predators, from red-tailed hawks in my backyard to jellyfish gobbling up zooplankton and white sharks chasing seals. I think predator-prey interactions are fascinating in that they can be completely raw, bloody, chaotic scenes, while also subtle, with indirect interactions that impact the entire ecosystem. They are complicated, ever changing and require a holistic vision to study. Is there something you think most people don’t realise about being a shark scientist? Shark scientists are scientists who love sharks. We actually spend 80% of our time writing, reading, teaching, etc., and only 20% (if we are lucky) with our study animals. When I speak to prospective interns or students, some don’t understand this and expect to be in the field every day jumping on whale carcasses. Shark Weeks of the past have done a real disservice to this new generation of shark scientists because they have been led to believe that this field is exclusively for bombastic men who live dangerously. The truth is, yes, this career can be dangerous, but we don’t go looking for it intentionally. Shark biologists want to be where the action is without being noticed so that we can observe the true nature, beauty and strength of sharks without influencing them. This takes much more skill and is much more thrilling. On that note, what is it like being a woman in the field? 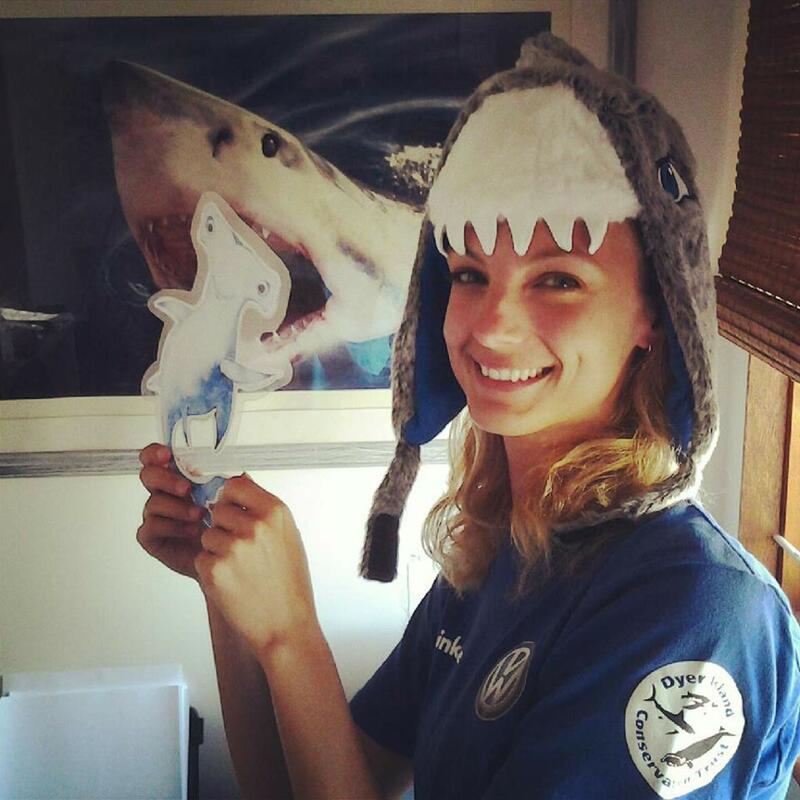 Do you have a message for young girls who might be interested in sharks and science? 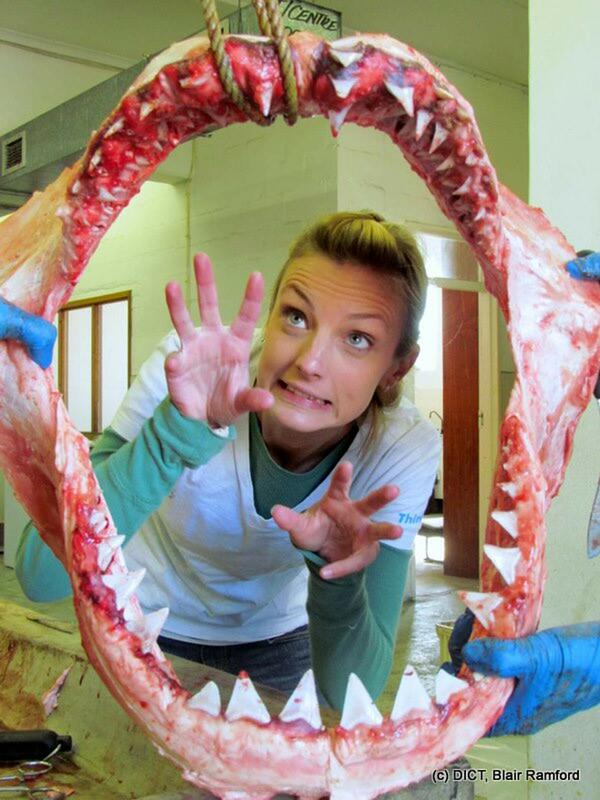 Many women shark researchers of my generation have had – and still have – a tough time. For me personally, I love it when people have superficially low expectations of me so that I can prove them wrong and challenge their beliefs. My South African boss also encouraged my confidence by loaning me the fastest rubber duck in Gansbaai as a research vessel, and I used to love storming the harbour with a following swell with my blond pig-tails flapping in the wind. Our generation of scientists is now rising to the top and encouraging diversity within research groups. Girls interested in science now won’t have the same experiences we did. So my advice is: join an online group to learn from as many people as possible (like the Gills Club) and don’t let the few discouraging people you will run into throw you off. Remind yourself of how hard you have worked and build confidence from the obstacles you have overcome. Do you have a favourite predator? If so, why? I should name a really obscure predator as my favourite and earn hipster ecologist points, but I confess my favourite species of predator is the orca. I have seen them in British Columbia and South Africa, and every time – as a fully grown woman – I scream and shout. [We know how that goes, Michelle. The '"squee" is hard to resist!] They are, without a doubt, the most advanced predator on this planet and I simply love them. Can you tell us about a memorable shark encounter? All shark biologists have a story about the biggest shark they have ever seen. Mine was a 5.5m-6m white shark cruising at the bottom of Shark Alley in South Africa. She was so large and dark that I originally mistook her for a whale calf and stopped the boat engine to avoid the mother whale I presumed was nearby. Once we realised the tail was beating side to side and saw her unmistakable dorsal fin, the entire boat fell quiet. It was bone-chilling and awe-inspiring. She was my submarine. A lot of our readers want to help sharks, but don't know where to start. What is something that the average person can do to actually make a difference? Know what fish you’re eating and pick sustainable seafood. For example, by eating sustainable sardines you help seal populations that then help great white shark populations. If we demand sustainable fisheries, we can help sustain shark populations too, and it’s an easy change anyone can make. We see a lot of negative conservation news about sharks all the time. What keeps you hopeful for the future? This is a truly exciting time to be a scientist. Not only are there more marine biologists now than ever doing really important work across the globe, but technology is also catching up to our needs. Today, we are learning so much more about sharks every year than the previous 30 years combined. Bad guys tend to get all the attention, but from my experience, there are ten enthusiastic conservationists for every poacher. The ocean might not look the same as it probably did 100 years ago, but I do believe we will be able to successfully preserve and rehabilitate it within the next few generations. When you want your shark fix, what blogs and sites do you visit? With 100% bias, I will direct people to the Gills Club. It’s a Facebook group run by more than 40 leading women shark researchers, and each month two scientists are featured and talk about their research and personal experiences. I have learned so much and have been inspired by reading their stories – and it is a great resource for anyone who is interested in becoming a shark scientist. If you haven't read Southern Fried Science, start now! Also, when you have a few hours to kill, check out the Chondrichthyan Tree of Life – you will be mesmerised. And here are some of my favourite shark photographers on Instagram: Thomas Peschak @ThomasPeschak, George T. Probst @IPhotographSharks, Amanda Cotton @acottonphoto, Joe Romeiro @joeromeiro333, Morne Hardenberg @Mornehardenberg, Simon Pierce @simonjpierce (to name a few, there are many more!). New York governor Andrew Cuomo’s shark catch was legal — but should we let him off the hook?